Mikko Toivanen, Sara De Moitié, Numan Shakil, Stanislav Malevich, Maritere Vargas, Maria Lumiaho, Natallia Tsikhanenka, Liva Kallite, Gearóid Crowley, Tommi Seppänen, Tim Iskhakov, Neil McAlister, Antti Sirkiä, Antti Ahvenlampi, Carita Närvänen, Terhi Aho, Olli Lehtonen, Sanna Valkeinen, Minna Asikainen, Stana Porvali, Henri Lehtonen, Helmi-Kanerva Tuori, Joonas Meriläinen, Lauri Viitala, Andreas Sahle, Anne Luotonen, Mikko Suominen, Talvikki Heike, Juha Niemi. Finavia is one of the most prominent organizations in the aviation industry of Finland. We run airports all across Finland and aim for creating an integrated and smooth passenger experience. With this website renewal project, our goal was to establish the website as the key digital touchpoint that would help align all our digital touchpoints to our vision of smooth traveling by providing the passenger control over their experience, and journey. We brought twenty airports from all over Finland together in order to make the website a defining entry point for traveling from or to Finland, which enables a coherent experience and one-to-many platform. Helping the passengers with their journeys by providing them empathetic, personalized, and contextualized experiences that emerge from the real-time data. The website provides a true cross-channel experience that connects all digital and physical touch points such as the mobile application, digital interactive map, info screens, shops and much more with the user journey. 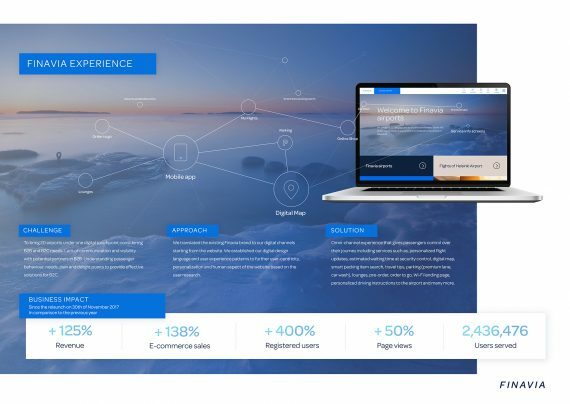 Bringing cohesion to the brand and user experience of twenty airports, we created an omni-channel experience that is user-centric, embodies Finnish design characteristics, and is modular to ensure scalability with the growing customer and business needs. The strategy for the website was designed by gathering the data employing various methods including in-depth user research, user journey mapping, user validation and ideation workshops with the users and the stakeholders, which helped us to define the value proposition and Key performance indicators. The target audience includes departing, arriving, and transferring passengers. While, the extended target audiences include airlines, media, organizations, and authorities. In order to meet our promise of having an integrated, smooth, omni-channel experience and commercial growth, we considered how to bridge the gap between digital and non-digital touchpoints. This resulted in our website that covers for both, by linking the O2O (online to offline) service and experience, that enables passengers to easily pick up in the physical environment where they left off from digital. After understating the users and business needs, the ideas validated with the users and stakeholders were then expanded from high fidelity prototypes into detailed designs. The design process was highly iterative with continuous feedback cycles every two weeks. We planned the project timeline to first develop B2C aspects in order to meet the customer’s basic needs. Furthermore, the focus was set to B2B for forming collaboration opportunities with the relevant business partners. Afterward, we moved to B2C extended services to further smoothen the passenger experience. Since the launch of the website, the impact has been extremely significant. Compared to the last year’s statistics, the revenue has increased 125%, the increase in the e-commerce sales has been over double; 138% increase to be precise, registrations have gone up to 400%. Moreover, there has been a 10% increase in the organic users per month and the page views have increased by 50%. The number of passengers this website has served is almost half the population of Finland and its growing every day while receiving extremely positive feedback.